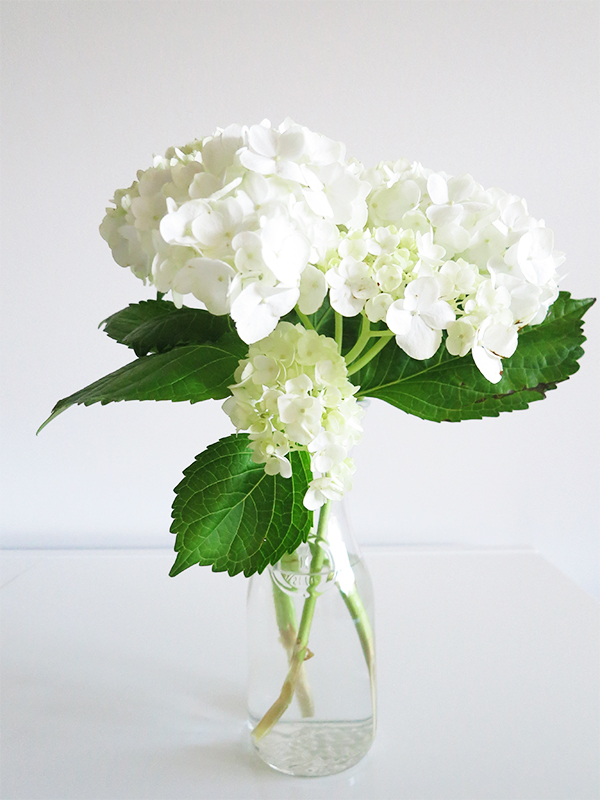 As soon as the too-short peony season is over, it's all about hydrangeas here at Solo Lisa headquarters. These summery blooms are so pretty and voluminous that it doesn't take more than a few snipped stems to fill a vase and make a statement. 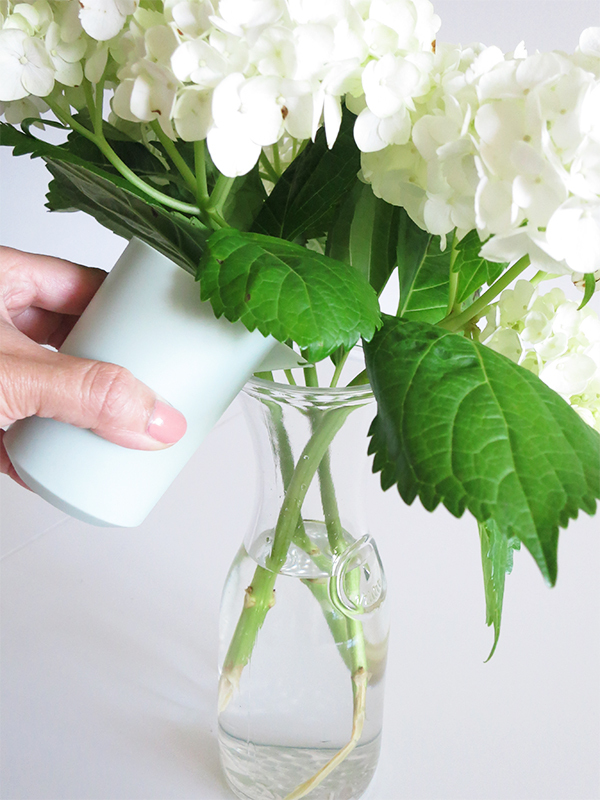 Plus, with a little TLC they can easily last ages without wilting, even in a sweltering apartment sans air conditioning. I've had the white hydrangeas above for 2+ weeks and they still look as good as they did when I brought them home from the florist, which is surreal considering a couple years ago, any hydrangeas I bought would shrivel in just a couple days. All my tips after the jump! 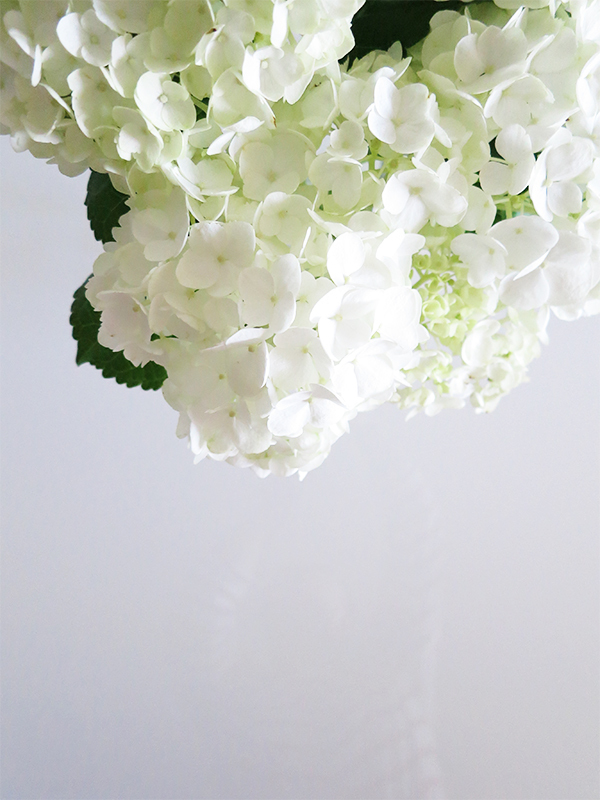 Hydrangeas absorb water through every part of the plant—petals, stems, leaves—but they also emit a sticky sap that starts sealing off a cut stem and inhibiting the bloom's ability to drink water from a vase almost immediately. 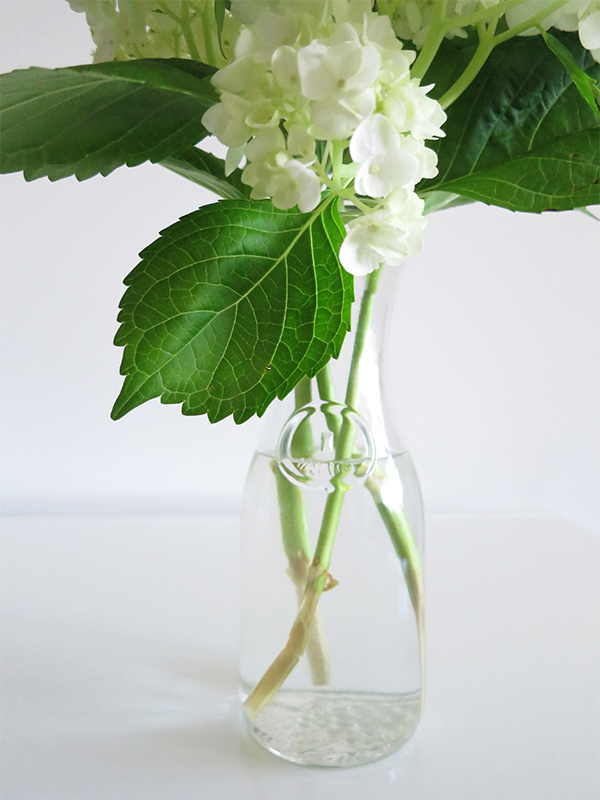 Therefore, the key to making hydrangeas last a ridiculously long time is to make sure the cut stems don't have a chance to seal, and the cut blooms are well hydrated overall. I give the stems a fresh cut at a deep diagonal angle to expose as much of the inner stem to water as possible; this increases the stem surface area through which the blooms can absorb water. 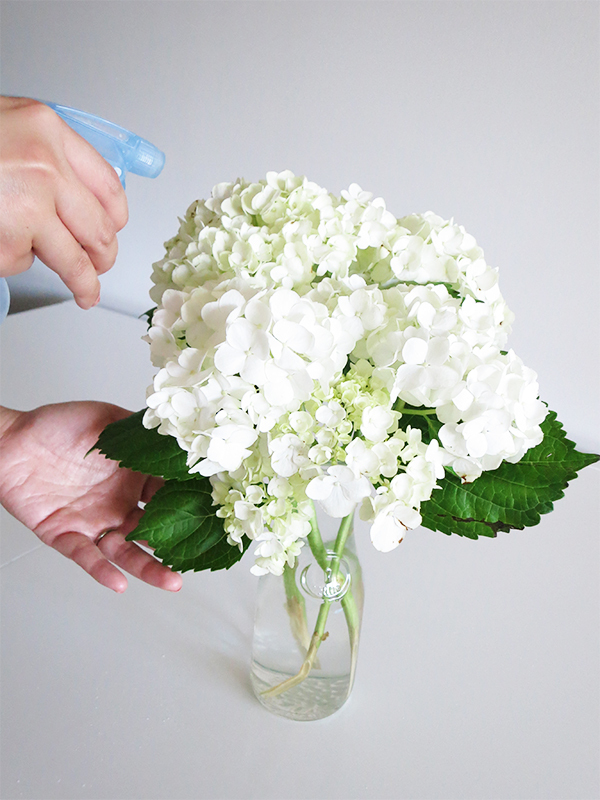 Have a filled vase nearby so you can plunge the stems in right away, before the oozing sticky sap seals off the incision. Keeping a few leaves for colour and texture is fine, but the large thirsty leaves lower down on the stem will only divert hydration away from the blooms. You don't have to take the hydrangeas out to do this. (In fact, it's better if you don't to prevent the cut stems from being sealed with sap.) Just fill the vase when the water level drops a little too much. This is the quickest way to revive petals and leaves that are starting to look wrinkled from dehydration. If the blooms look especially parched, try draping a sopping-wet paper towel over them or even dunking them in a container of water for 20 minutes. And that's it! 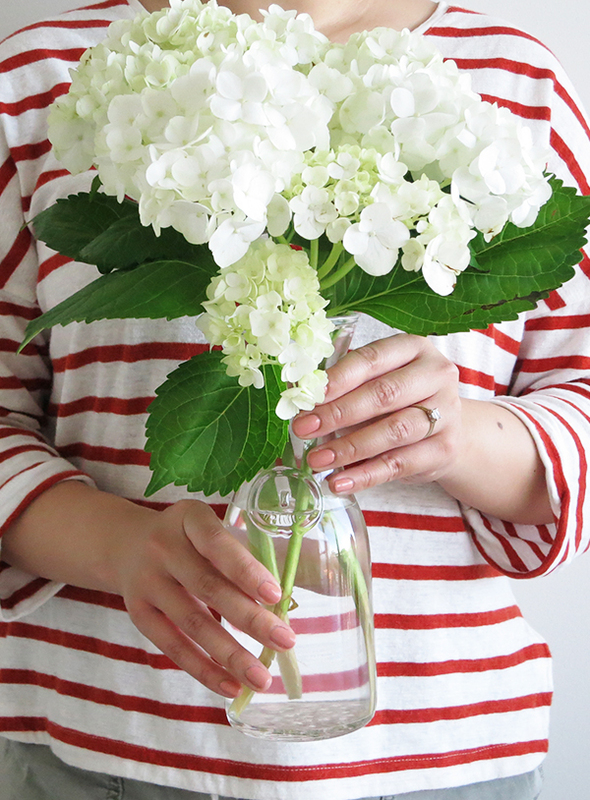 True story, my friend once made hydrangeas that were snipped in July last until mid-October with these tips. I don't know if the white ones will last that long, but they have a couple of weeks left in them at least as long as I care for them properly.